This document describes functionality only available if you have taken control over a Toolkit configuration. Please refer to the Shotgun Integrations User Guide if you do not have a more advanced configuration. The Shotgun engine for the shell works in conjunction with the Tank command. Once the engine has been installed, you can run Shotgun Pipeline Toolkit apps straight from the command line. The Tank command will take care of listing and presenting the user with the different installed apps that are available. The engine forms the bridge between the terminal and the installed apps. If you have PySide or PyQt installed, you can run apps that have a UI straight from a shell. The Shotgun engine for the shell handles command line interaction and is tightly integrated with the tank command which is distributed as part of the Core API. When you execute the tank command in a terminal, Toolkit launches the engine to handle app execution. If you have access to the Shotgun Pipeline Toolkit, you also have access to the source code for all apps, engines and frameworks in Github where we store and manage them. Feel free to evolve these items; use them as a base for further independent development, make changes (and submit pull requests back to us!) or simply tinker with them to see how they have been built and how the toolkit works. You can access this code repository at https://github.com/shotgunsoftware/tk-shell. 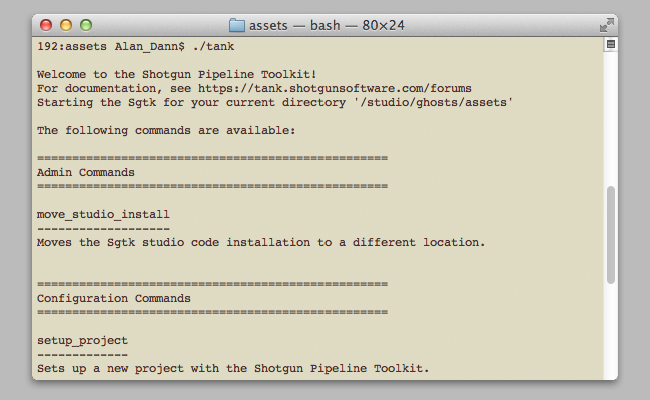 You need Shotgun Pipeline Toolkit Core API version v0.14.56 or higher to use this. Removes the clearing of Qt library paths introduced in v0.5.2. Check for an existing QApplication before attempting to create one. If a QApplication is already running, execute the input command immediately. If a QApplication needs to be created, do so, then queue the input command to execute using QTimer.singleShot() and start the exec_() loop. Resolves #38354. As with the tk-nuke engine, context changes in the shell engine can now be performed via the sgtk.platform.change_context() function. Fixed a PyQt issue with dialogs and made the engine more flexible about when PyQt/PySide can be used to show UIs. The engine used to allow UIs to be displayed using the engine's show methods only if they were executed through commands. Now the engine allows the methods to be invoked as soon as a QApplication is made available. Therefore this allows UIs to be shown while using the tank shell command. Added a default application icon for UI apps. Engine now supports PyQt4 for UIs. This is detected at runtime, and if tank can load PyQt4 from the python system path, it will attempt to use it. This is a fallback in case PySide is not found. Better error messages when PySide/PyQt4 is not installed - the engine now presents some more polished feedback in the case a UI based app is launched but neither PySide nor PyQt exists to handle the UI creation. Better handling of keyboard interrupts. Fixed issue when running some apps with PyQt. Minor adjustments to PyQt initialization. Details: - Added QT support - Added support for Core v0.13 specifics; logging, execution etc. And the opposite? How would one add the shell to the desktop launcher, ie tk-shell?